As an older white myself, I know that the ageing process is not easy or gracious in all respects. It’s not always an entirely pleasant process wondering if certain things compensate (or even more than compensate!) for the loss of freshness and vigour. 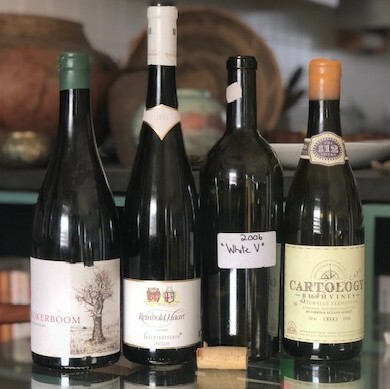 Christian Eedes’s Winemag report was also enthusiastic about the whites – and I’d actually been surprised at how many white entries there had been, given the traditional local disdain for white wine ageability. He cited the statistics: “59% of the white wines and 38% of the red wines rated 90-plus suggesting once again that litre for litre, South Africa makes better white wine than red”. That’s a very interesting result. Unquestionably, though, Cape reds, if we go by what’s happened up to now, will age better than whites over the much longer term. When Michael Fridjhon does his annual tasting of older Cape wines, mostly for the foreign judges on his Trophy Wine Show, the required minimum for reds is 25 years, for whites just 15. The experience of that tasting inevitably proves the correctness of the strategy – and even so there are always many more reds than whites available. But I think that is slowly changing with the years, as, especially, the newer-wave chardonnays and white blends come into contention. I buy quite a number of ambitious Cape whites each year (and only a few ambitious reds – I get more foreign reds, and very few foreign whites). But I tend to put them away, and recently I’ve been becoming aware that they are piling up and ageing (mostly the oldest about 10 years, but a few rather more), and perhaps some of them getting past their best. So the last months I’ve been drinking them, with mostly gratifying results. Recently I had three 2006 whites – but two of those were Mosel Spätlese rieslings. Really lovely they were: golden and getting hints of that savoury, almost mushroomy character of fine old riesling, and the merest hint of petrol – no longer really fruity, and the sweetness less apparent than in youth. The Reinhold Haart Goldtröpfchen especially winning, while perhaps the bottle of Karthäuserhof was inching its way downhill, though not far off its peak. The other 2006 was a local – a rare one from Vergelegen. I must have got my bottle as a Platter sample, as the little self-adhesive label just says “White V”. It was eventually bottled as a one-off Nirvana White, André van Rensburg reminded me when I asked him about it this week. He had been playing with the possibility of creating a white counterpart to the red Vergelegen V, and this wine was almost entirely semillon, with just a little sauvignon. The Vergelegen white blend (various names over the years, now GVB White) has an excellent record of ageing beneficially, and this version was no exception. Like the German wines, it had developed beautifully, transforming that early raw fruit (and oak support in its case) into new and lovely, complex characters. My bottle was in great condition, though André told me that last year he’d had to open three bottles of this wine before he got a really good one. Semillon is a great grape for maturing, of course. So can chenin blanc be – certainly from the cooler Loire; we’re still finding out and working on the local version (its youthful splendour not in question). I’ve fairly recently had more than a few bottles each of two blends containing chenin: Sadie Palladius 2008 was both interesting and rather deliciously advanced, but I think I’d have enjoyed it even more a few years back – and I think I blame the comparatively large proportion of Viognier used in those days for it not being fresher. The bottles I’ve had have been consistent (except for one which was corked!). I must say that a few even older vintages of Palladius were in great shape when I tried them at a Cape Wine tasting last year. The other blend was Alheit Cartology 2012 – the second vintage of this wine (including Semillon, of course – a much more likely candidate for ageability than viognier). My experience of this vintage has been inconsistent, with some of the bottles definitely past their best – but my last bottle was really excellent, though not for further ageing I think. Some months back, the maiden Radio Lazarus 2012 Chenin was superb, and I’m glad I have a few more (and desolate about the death of the vineyard). Last night I settled on another Semillon. Ten years on, the maiden Sadie Family Kokerboom 2009 (the one with the Kentridge label), is drinking very well, with no sign of tiring. Less refined, more exuberantly powerful than the Vergelegen 2006, it has a touch of raw pungency and plenty of vigour and flavour. It’s a rich, warm-country wine, though the 14.5% alcohol and the more moderate acidity are balanced. The two wines speak of the potential of the variety, the skill of two fine winemakers, and, perhaps above all, of their origins. Maturity makes them even more eloquent than they were in their youth. Have you ever, or are you even able to, collate your many articles from over the years. I think it would be a fascinating collection and I for one would certainly buy it. On ageing I think we could add flabbiness as an unwelcome development, but perhaps some aged wines do impart of a sense of introspection and contemplation which are among the benefits of getting older. Stewart – thank you for the compliment. I’m not at all sure much of what I write would stand the test of time. As to flabbiness and ageing – yes indeed, though it’s not incompatible with some marked acidity and astringency….